In September my dad was in KC for some business and a golf tournament and my mom sent with him some fabric she had that she knew I liked. I’m enjoying the change. 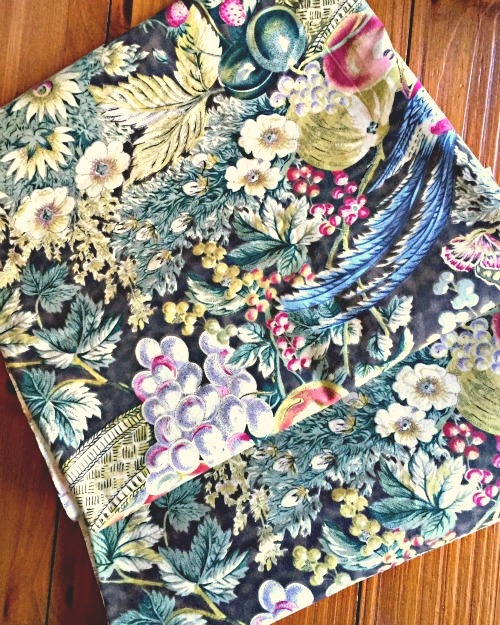 The print is more sophisticated than the previous curtains and the colors are warmer – great for fall. And I’m saving the old curtains (also courtesy of mom) in case I want to lighten things back up again. Speaking of my parents, you may remember this picture of carpet samples I was considering for our stairway. I liked the black sample too, but I knew almost from the beginning that I would be going with one of the herringbone patterns, and I ended up choosing this dark grey one. “Funny” story: when they came to do the install we discovered they had brought the wrong carpeting. We discovered that after the old carpeting had been ripped out, so we lived with just the pad for a couple of weeks while the correct carpeting was (re)ordered. Definitely a first world problem, and it was a fun conversation piece for a while, but we were happy to get the new stuff in. Having no exposed tacks is definitely a plus when going up and down stairs. And then there’s this champagne bucket. 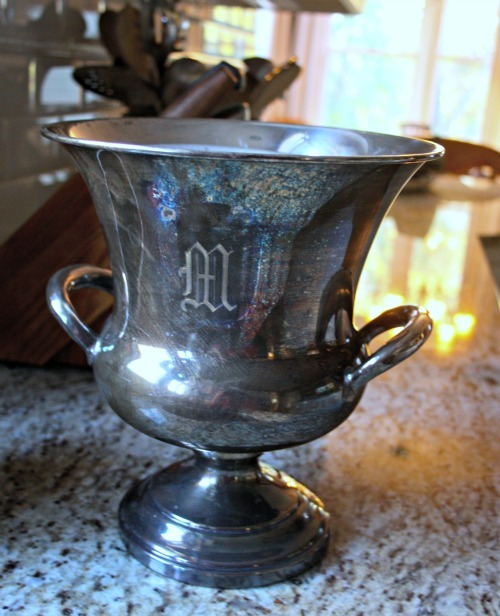 I ran across it at an estate sale this week and turned it around to find that, not only was it monogrammed (love! ), but that it was monogrammed with the first initial of our last name. I really had no choice at that point. I used the super easy/lazy silver polishing method on it when I got it home and snapped this pic midway through because it’s always such fun to see this at work. Now it’s almost too shiny. I’ll enjoy watching it get a little bit tarnished. Finally, here are some things I found interesting and inspiring on the web. I bookmarked them to share with you here. I thought these ten thoughts on hosting Thanksgiving were great tips and reminders. Don’t you love Steve Martin? He’s such a wonderfully multi-talented and multi-layered guy. Case in point: he recently held a tag sale at One Kings Lane of things he’s collected over the years. Everything was way, way out of my price range, but I enjoyed looking through the sale and reading the descriptions/captions that he wrote. A food editor followed her mom through Costco and the result was this fun post with pictures. I loved this lady and learned a lot. 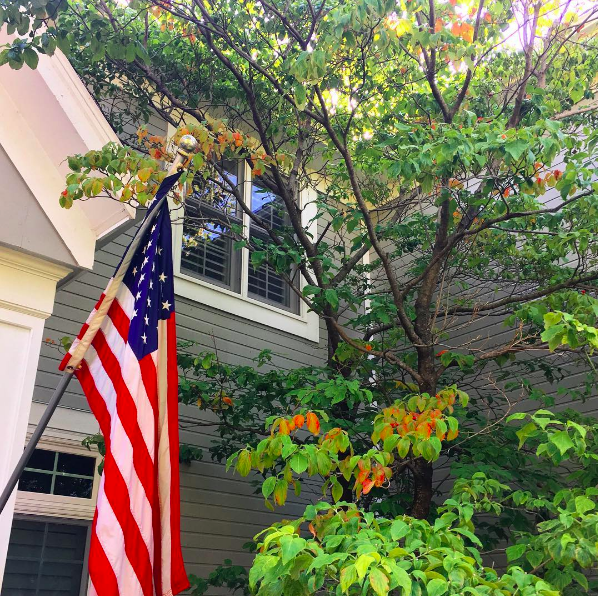 Have I already shared these ten tried-and-true decorating rules from a former Southern Living magazine editor? I feel like I have but decided they were worth a re-share anyway. P.S. In between posts you’ll find me on Instagram. Sherri, we have a gray marble tile which you can see a tiny bit of in the carpet samples picture. It’s pretty plain…so busyness wasn’t an issue. I hope to have all wood on the first floor at some point. Limestone tile sounds very pretty, as does a trellis pattern. And I understand…these decisions can get overwhelming. Hi Julie, I am lovin’ your carpet choice! I remember having a Chesterfield coat in that same pattern many years ago. Wish I had it now. All the oldies become goodies again if you wait for it. Happy Thanksgiving and glad you posted the tips. Sounds like such a classic coat, Karen. Happy Thanksgiving to you too! 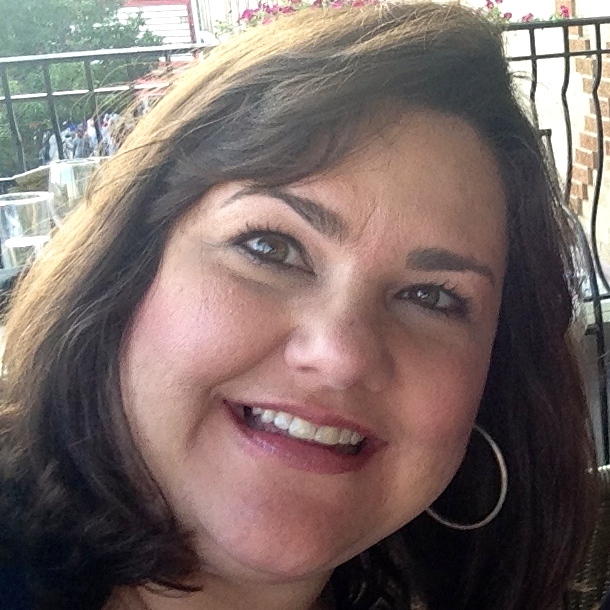 Julie, I love the carpet choice…beautiful with your gray tile! 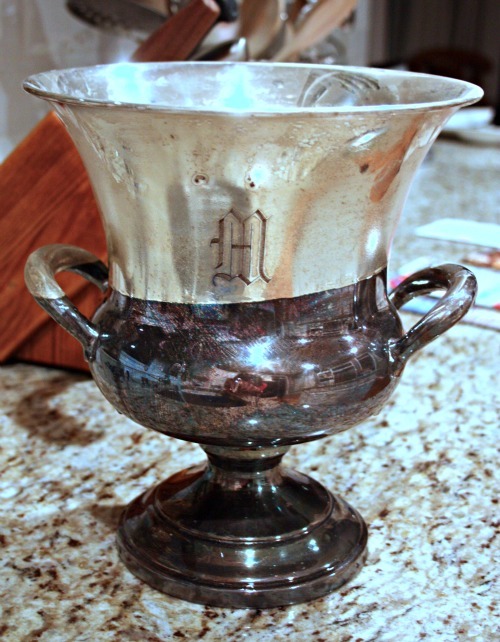 Someone gave us an almost identical ice bucket as a wedding gift 38 years ago. It’s lovely but no initial. That curtain fabric is also beautiful. It would have grabbed my eye in a heartbeat. 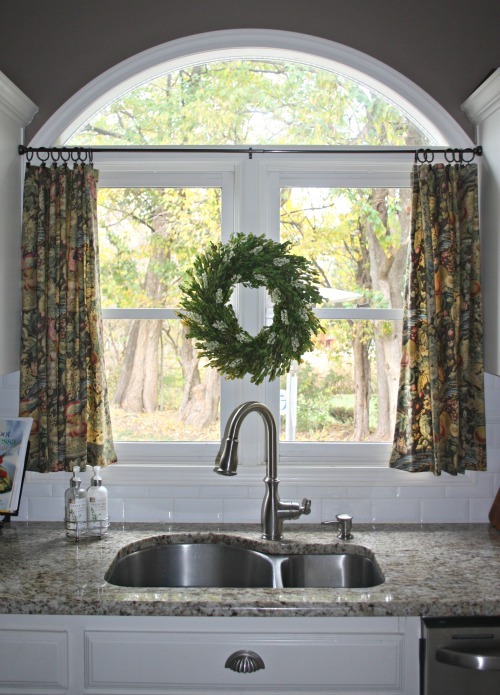 I also think your kitchen window would be lovely with just the wreath. Thanks for your nice words, Jillian. Congratulations on 38 years! Hurry and help me! I want to buy silver (some kind) candlesticks from ebay. I don’t know what silver to look for!!! 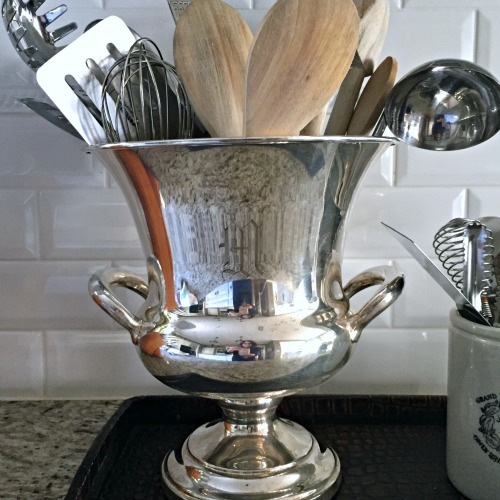 I want it to attractive like your champagne buckets, affordable, useable,, and I want to use the baking soda method to clean them. Teach me, quick, so I can use them for Thanksgiving. Hi Nan. I would just look for silver plate (less expensive than sterling) candlesticks in good condition and in a in a pattern/style you like. In addition to eBay you could check Etsy.com or local antique shops. Good luck! Beautiful stairway! 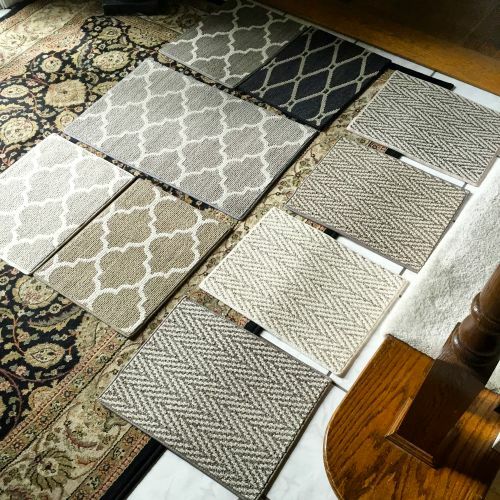 Please tell me where you got all your carpet samples from — I just LOVE the herringbone! Hi Erin, I got them from Nebraska Furniture Mart in Kansas City. Hi! 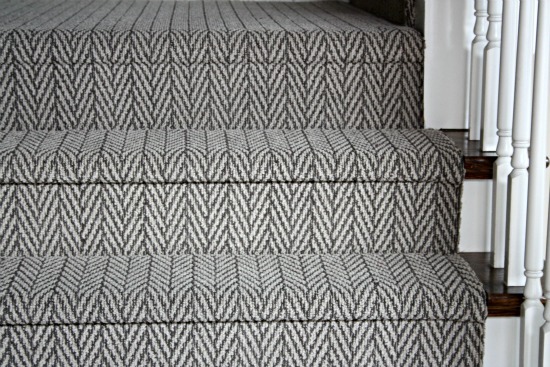 I love the Herringbone Carpet for the stairs! Is it a flat weave? I have been trying to find one for our house that we are building. Would you mind telling me what brand it is? Thanks so much!! Hi! Love the carpet you chose for your stairway! 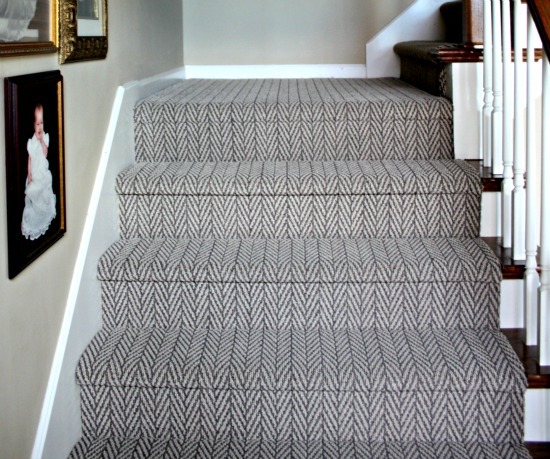 Would you mind sharing the color name of the Tuftex carpet you chose for your stairs? Was it the Windsor Gray or the Chateau? Also, would you mind sharing your carpet padding thickness? We’re thinking about using a thicker pad (7/16 inch) but have been told thats too thick for a stairway. Do you like the feel of your current padding? Hi Ophelia. I can’t for the life of me remember the color, but I went online to look at the options and I’m pretty sure it was Chateau. Also, we just used the standard pad. No special thickness. Hope that helps! Good luck with your decisions. Julie, I am looking at a swatch board of this carpet today. Chateau looks pretty dark. You think that is what you used, though? I am trying to work with gray walls and white trim like you have. Also, I just found your blog. I am in KC too! I got the sample board from Carpet Corner. Did NFM have all those single samples? I think that is what I need to see to choose. Did the color of carpets every get solved? I am using this and really like your color. I’m at a carpet store now and I’m trying to bit the same Tuftex herringbone! Was it in fact chateau? Or carbon? Ahhhh! Help please! Ahhh…Corinne I’m late! Let me see I can find the answer. I’m certain it wasn’t Carbon. What gray color did you choose for your runner? I’m looking to install the Only Natural carpet on my stairs now but am having trouble choosing a color. Yours looks great!